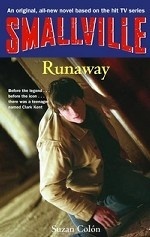 Аннотация к книге "Smallville: Runaway"
If you`ve ever had one of those days where nothing goes right and it seems like the entire world - even your closest friends - is against you, then you know how Clark Kent feels. There`s only one thing he can think to do: leave his family, friends, and home in Smallville and try to make a new life in Metropolis. In the big city, Clark finds a band of other runaways, including a girl who seems to have powers as mysterious as his own: She senses his secrets and somehow knows that he`s different from anyone else in this world. And even though Clark thinks he`s left his troubles behind, his presence in Metropolis starts a chain of events that could lead to more danger than even he can handle.